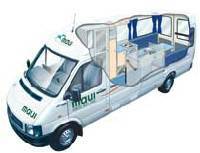 Perfect motorhome for a couple who want the freedom to stop and stay in places that do not have wash room facilities. The Spirit 2TS is a generously sized vehicle for 2 adults. Added features such as a spacious living area, excellent interior height and a huge double bed will make your travels comfortable & relaxing.